Gone but not forgotten. Big Foot sightings are more common than a Chevy Vega on the back roads of Alabama. That’s why my jaw dropped when I spotted a small herd of Chevrolet Vegas gathered alongside a winding, mountain road. More Vegas were discovered as I descended terrain perfect for hiding moonshine stills. I suspect these examples were hand-me-down refugees from the 1970s. All hiding from discordant owners, who had used them as storage bins or garbage cans. What else could explain the trash piled in the seats? Flat tires, missing wheels, busted glass. The neglect and abuse could not be hidden by dead leaves or fallen trees. 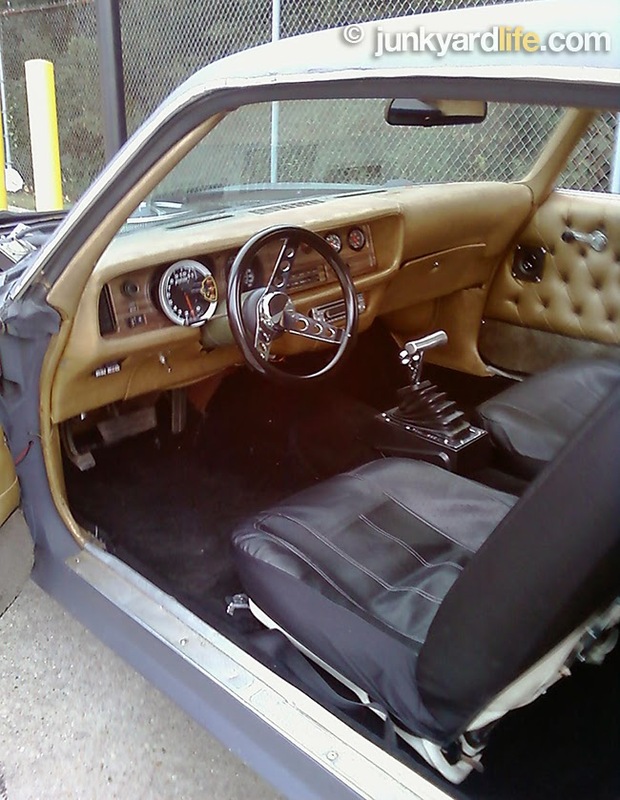 The green Vega is a 1971 model (pictured), one of more than 270,000 that were produced during the inaugural year. 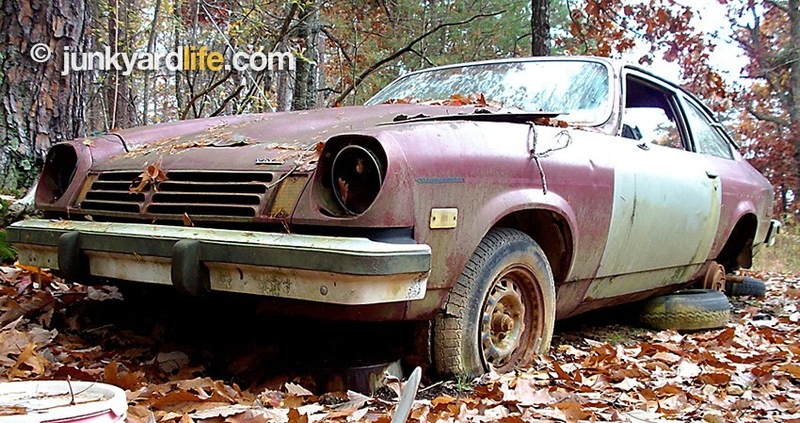 Believe it or not, the Vega was Motor Trend's "Car of the Year" in 1971. Not all of them were green. 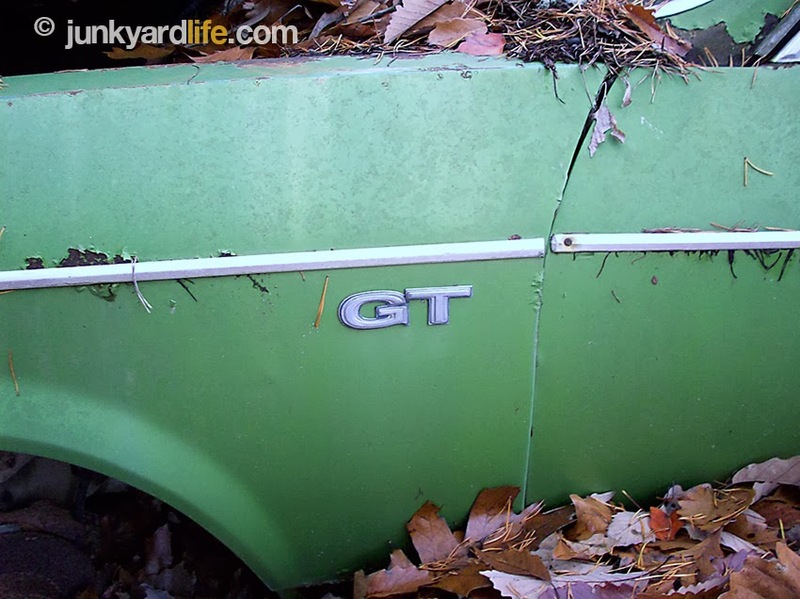 This one sported GT fender badges and a surprise inside the rear of Chevy’s first compact car. A quick inspection of the hatch revealed engine parts. A maroon 1974 Vega positioned behind the green '71 makes it easy to compare the design evolution at Chevrolet during that time period. The grill and headlight area of the Vega and Camaro shared many styling cues throughout the Vegas production run. The early ’71-’73 Vegas are favorites among collectors. Wide-mouth grill of the 1971 Vega mimics Camaros of 1970-73 vintage. 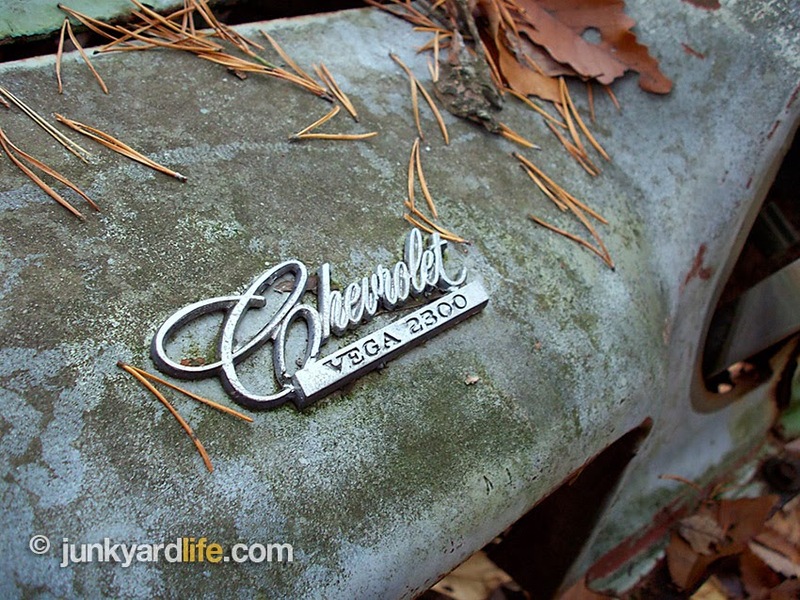 Nearly 2 million Chevy Vegas were built between from 1971-77, during their seven-year production run. Chevrolet’s first stab at building small cars was successful in terms of sales but proved to be a long-term fiasco that harmed GM’s reputation. Resale values of American-made compact cars, even ones built 30 years after the first Chevy Vega, has been laughable in comparison to their Japanese counterparts. My first car was a 1976 Pontiac Astre, a biological twin to the Chevy Vega. Why do I like Vegas? My first car was a 1976 Astre, Pontiac's 'version' of the Chevrolet Vega. 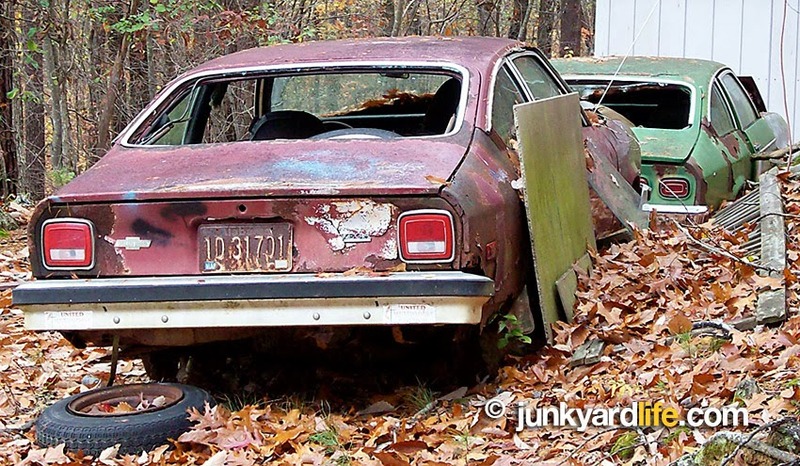 These unloved underdogs of the "H-body" platform bring back fond memories. I learned to drive and do stupid stuff in that car. It had a bent fender when I bought it for $160 in 1988, and yes, it was green. My dad helped me get the car ready for the road. I 'helped' by staying out of his way, mostly. Dad straightened the fender with a chain wrapped around a tree and offered to paint the entire car. A shelf full of old automotive paint, bought in bulk, for cheap was where I shopped for paint in our garage. I wanted black, dad wanted yellow. Guess who won? My dad said black would show every imperfection. To me, yellow paint screamed, "Watch out! Student driver on the loose!" That color probably saved my life in the long run. 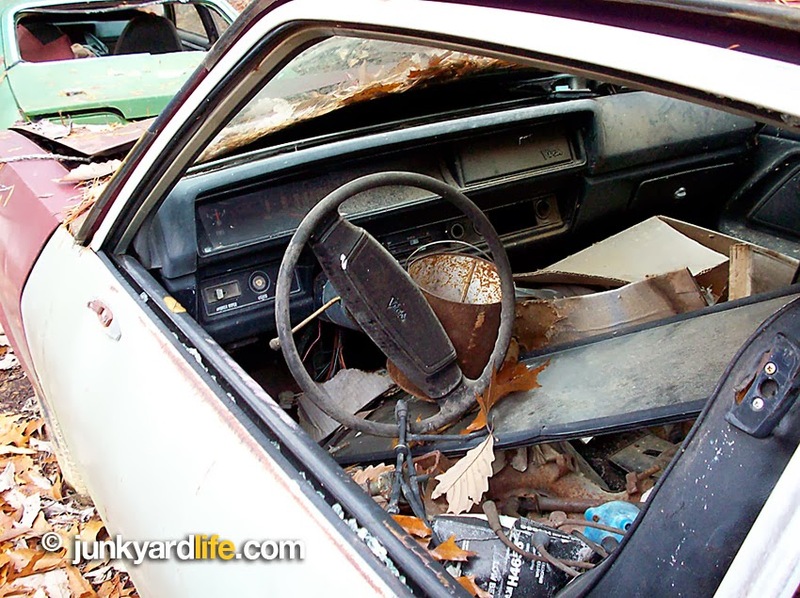 My Pontiac Astre would burn rubber, provided I was making a sharp turn from a dead stop. I would floor-board it every time I took off. The Astre was powered by Pontiac's 151-cid (2.5-liter) "Iron Duke" four-cylinder engine. That 90 horsepower engine was rock solid. It was a good first car. I wish I still had it. Chevy Vegas. 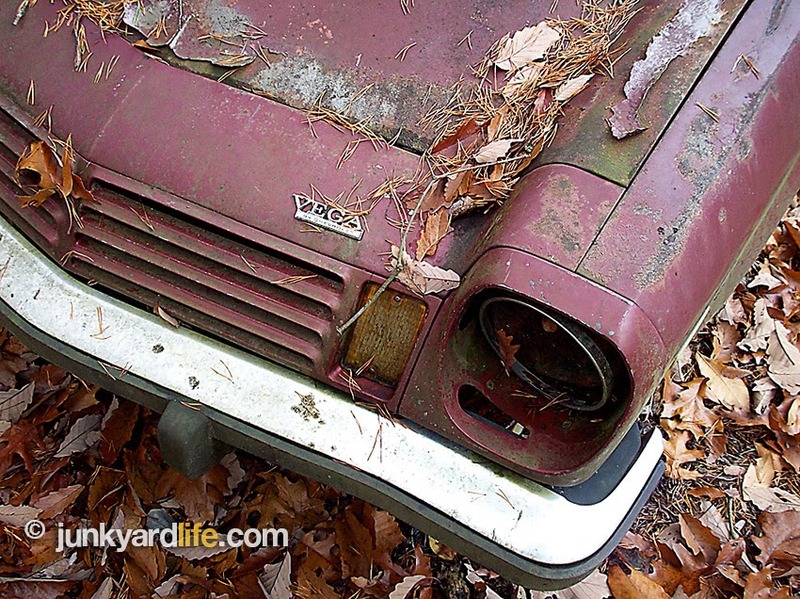 Driven hard, wrecked, sporting half-hearted repair jobs and left for dead. I passed two more Vegas on the way down the mountain. 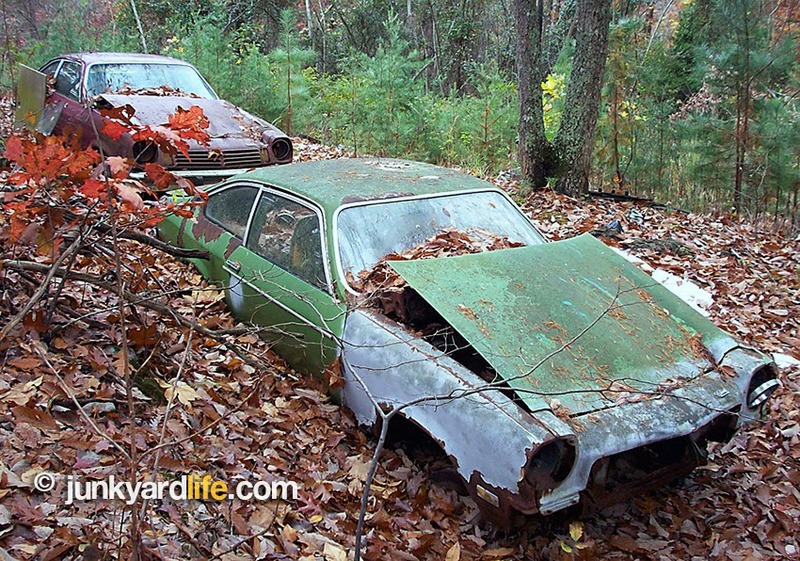 Sitting in a yard overgrown with cars was a silver 1975 Vega GT with a mismatched door and crushed by a tree. Next to it, a red Vega and a manufactured home were unharmed. 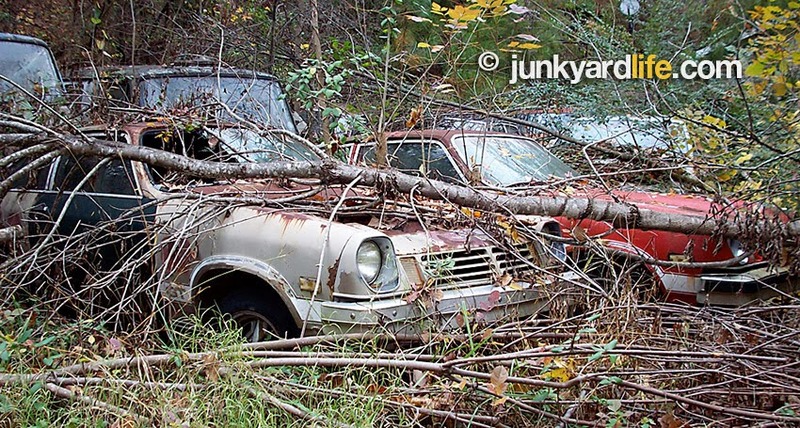 A 1975 Chevy Vega GT smacked by a tree down was parked in an overgrown yard a half-mile down the mountain from several other Vegas. 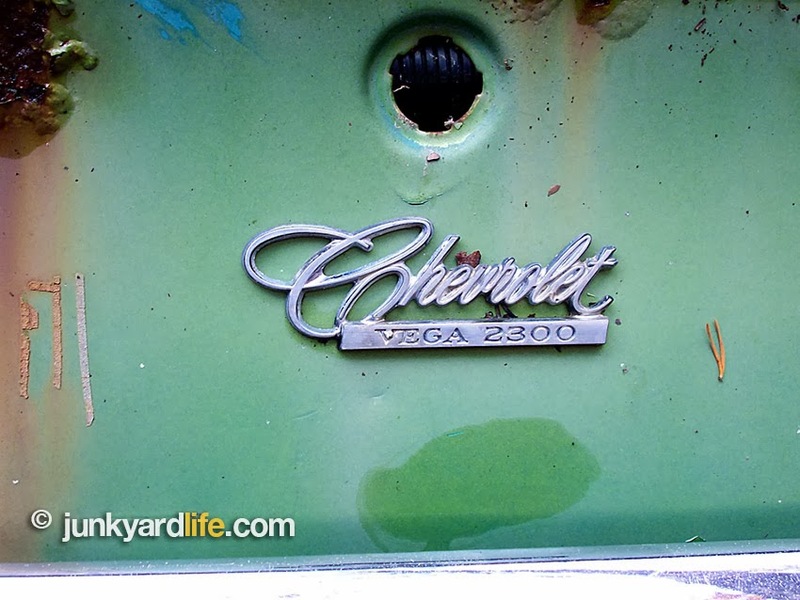 1971 Vega tail panel emblem. 1971 Vega GT had a 2-barrel carburetor and 110 horsepower. Vegas had an aluminum cylinder block and cast-iron heads. The original SOHC head was hiding in the hatch. These Vegas, photographed and documented in my original 2008 story, have vanished from the woods. My Vega photos were used on many other websites. I thought it was time to reclaim them for Junkyard Life. 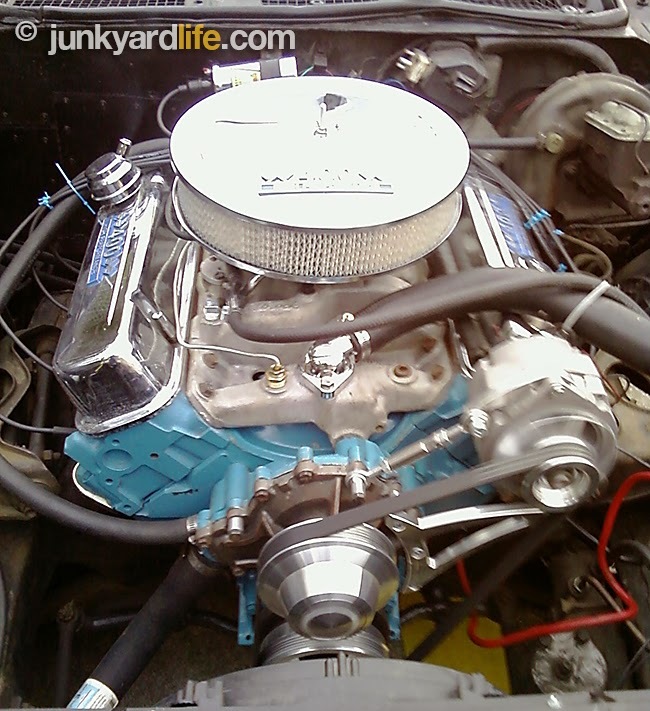 A 140-cubic inch (2.3L) SOHC straight-four cylinder engine powered base Vegas with a 1-barrel carburetor and 90 hp. Busted glass, piled with trash, just another Saturday night in a Vega. 1974 Vega, check out the aluminum bumper. 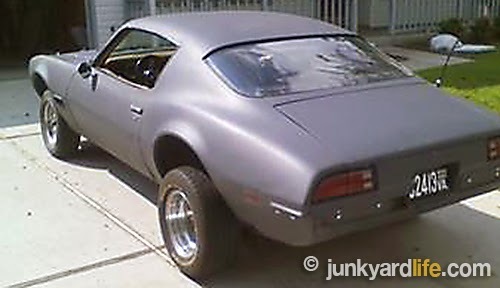 The Camaro also went to aluminum bumpers that year. Craigslist Firebird flies again. Chris George, a Marine stationed in North Carolina, was determined to build his latest online find, a 1971 Pontiac Firebird, into a beast. Visions of a full restoration were quickly put to rest as George decided a budget build was the best way to avoid frame-off frustration. 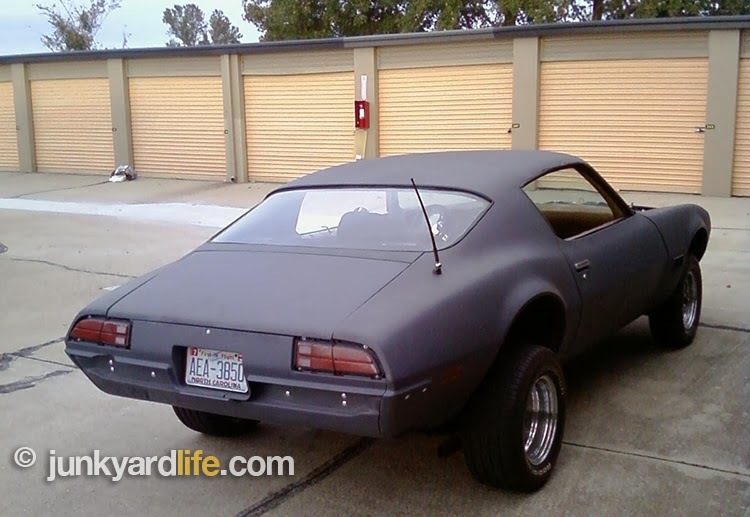 A fresh engine build and a $75 paint job put this bad ’Bird back on the road. 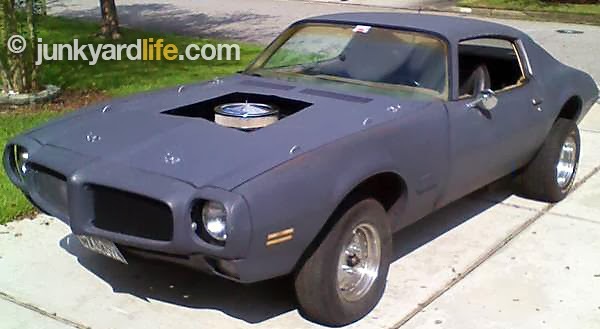 A fresh engine and primer turn this 1971 Firebird into a respectable cruiser. “My first car was a red 1984 Pontiac Trans Am,” said George. Now, 25 years old, George remembers the fun he had cruising the hills of New Hampshire in his first car without a license. New Hampshire authorities may not look back so fondly on all of the details. "I bought it when I was 15 years old and it ran like a champ," said George. “I put 2,000 miles on it before I had a driver’s license.” The T/A’s still potent 305-V8 engine helped George forge a strong bond with Firebirds. 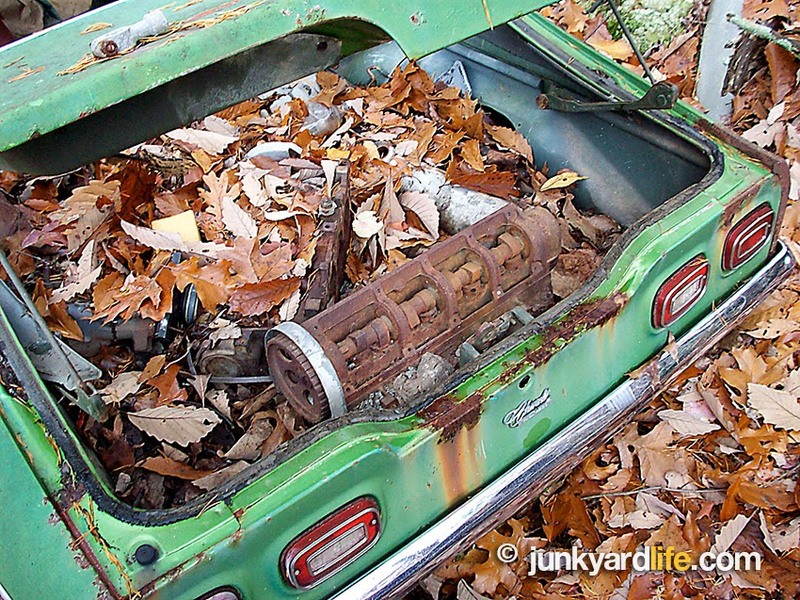 A deal was made on the green project Firebird with a seized 400 Pontiac engine. 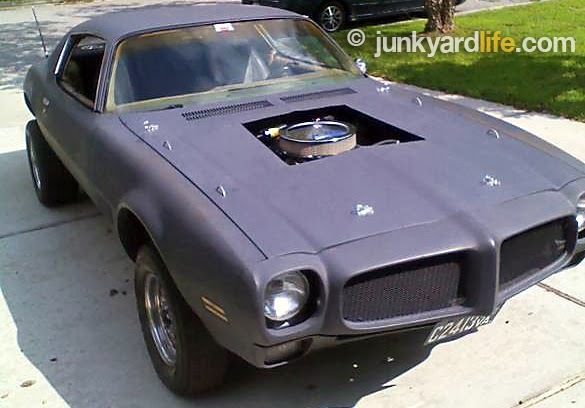 1971 Pontiac Firebird as it was found on Craigslist ad. 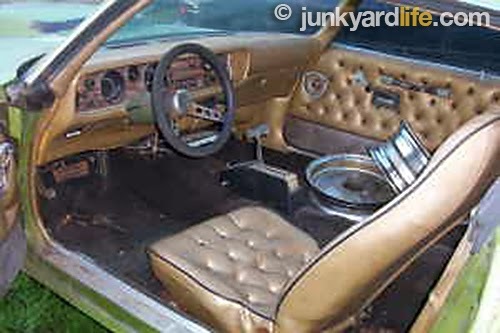 Custom diamond tuck interior dates the ’71 Firebird. 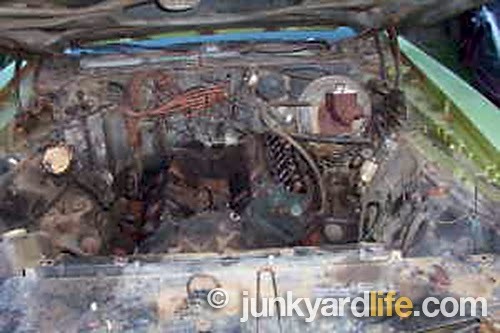 Engine bay of the 1971 Firebird was a ready for revival. 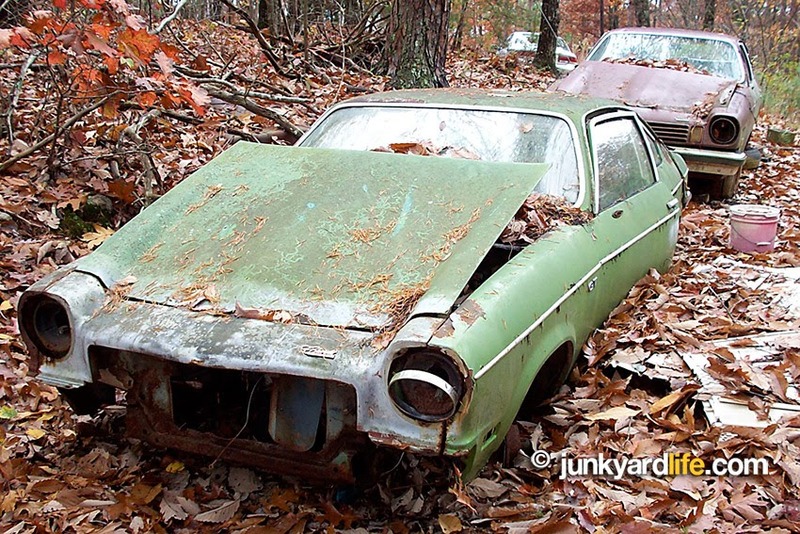 George decided to fight the urge to do a frame-off restoration on his non-running, second generation, F-body project. He knew that the sooner, he got the car running, the better. Spending money on a car you can drive will keep you motivated. The glowing green Bird’s big ’n little wheel/tire setup was a clue as to what extinguished his Pontiac’s fire power. During the engine teardown, George found a broken valve parked inside the #7 cylinder. The block had been bored .060 over by a previous owner and had a history of drag racing abuse. 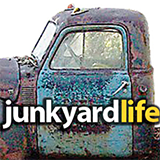 George sanded the body down to bare metal and removed five pounds of Bondo in the process. Fifteen spray cans of primer/sealer managed to cover the entire body in three light coats. 1976 Pontiac 400 block and 1968 Pontiac 350 heads motivate the ’Bird now. New seat covers freshen up the cockpit of the 1971 Firebird. George only drives the 1971 Firebird on weekends. Driving or parking the ’71 Firebird in the rain is a no-no. 15 cans of primer coat the ’71 Bird. 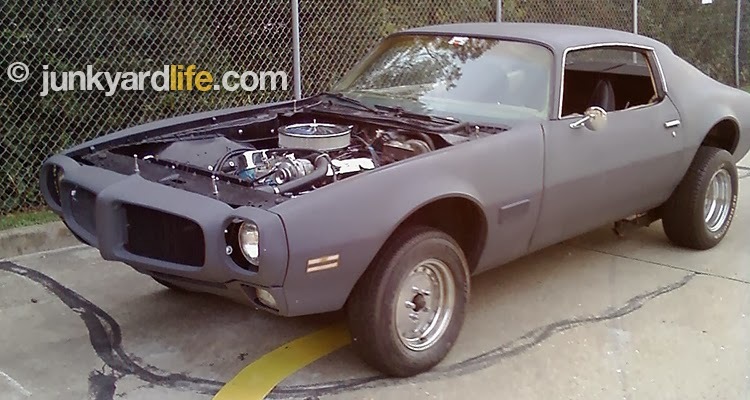 Rescued ’71 Firebird as it looks now.